Laura qualified as a veterinary nurse in December 2015 and joined Penmellyn in April 2016. 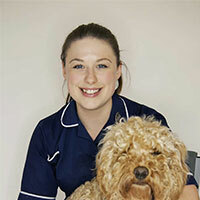 She enjoys all aspects of veterinary nursing especially caring for hospitalised patients; and she would also like to obtain an additional qualification in emergency and critical care in the future. At home she has Lottie a Labrador cross and two cats Vinny and Malibu.